Their bees produce the most delectable honey in all of Wisconsin. 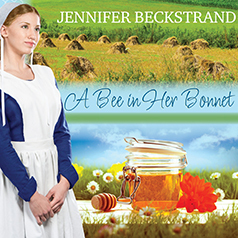 And the three Christner girls are fondly known as the Honeybee Sisters throughout their peaceful Amish community, where their spirited sweetness is attracting any number of hopeful suitors . . .
Lively, determined, and independent, Poppy Christner isn't about to let some vandal keep making mischief on her family's farm. She's been outrunning boys and standing up for picked-on children ever since she was a girl—no matter how much her prideful, arrogant schoolmate Luke Bontranger insulted her. So Poppy certainly doesn't need his interference now, especially since he's made it plain he prefers demure, ladylike companions. In fact, if Luke doesn't stop helping her find the culprit—and growing humble and remorseful—she'll be forced to notice how handsome his change-of-heart is making him. And that could mean falling in love—maybe for a lifetime.